Can this phone bring you a little zen? It feels like an awful long time ago that Jonney Shih, the Chairman of Asus, stood up at CES in Las Vegas and with no shortage of drama announced the new ZenFone range. And it is no surprise that it feels like an age has passed, since it has been eight whole months between the announcement of the ZenFones and the units being made available for pre-order by Asus in the UK. This is not the first time that Asus has announced products and then not delivered them in a timely fashion and it is somewhat unfortunate. Asus has been one of the more innovative Android device manufacturers over the past few years with the PadFone and Fonepad ranges just some of the evidence for that accolade. Despite the ZenFones being fairly ordinary by Asus standards they were highly anticipated and it is with some excitement that I am able to finally deliver a verdict on Asus' efforts. I have been looking at the ZenFone 5, the middle of a range of three (ZenFone 4, ZenFone 5 and ZenFone 6). The number in the name denotes the phone's screen size. The diminutive ZenFone 4 is the smallest, cheapest and least powerful of the three. Its two larger siblings have quite similar specifications but, on paper, the ZenFone 6 has the best camera and fastest performance. The three models share a strong family resemblance and most interestingly Intel Atom systems on chip powering them instead of the usual Qualcomm Snapdragon chips we have become so accustomed to. It is not every day I get to look at the back of a smartphone and see the Intel Inside logo. The design of the ZenFone range is at first rather traditional and staid, but look a little deeper and there is an awful lot to like. The textured plastic underneath the capacitive buttons has a circular pattern to it not unlike the back of an Asus laptop and the light shines off it in interesting patterns. It is never distracting when using the phone but it adds a little interest to an otherwise fairly plain front. Those capacitive buttons are in the correct order for an Android phone although I would prefer them to be on-screen. The biggest problem with the buttons is that they are spaced too far apart and they are not backlit. That lack of backlighting is the first clue that this is a budget phone. On the ZenFone 5 there is a very bright and sharp five-inch 1920 x 1080 pixel screen. It is fair to say that the bezels to the sides of the screen are a bit too large though. If you have used any other Asus five inch screened phone, this one is basically the exact same size. There is a 2MP front facing camera, proximity sensor, light sensor and notification LED above the screen. A complete array of sensors is nice to see as the cheaper ZenFone 4 does not have the light sensor and therefore has no auto-brightness. The back of my review ZenFone 5 is finished in this rather fetching red, but it's also available in purple, white and black. Asus says the back feels like ceramic. It doesn't. It feels like what it is: fairly basic plastic. This is not really a criticism of the material; at this price point Asus has done well to make the phone as sturdy as this. The biggest problem with the back is how prone to fingerprints it is. The 8MP camera with LED flash is mounted above the Asus logo with a wide speaker grille beneath that Intel Inside logo. Asus has positioned the buttons and ports in sensible locations on the ZenFone 5 with power and volume controls on the right side, microUSB on the bottom and a standard headphone jack up top. Prise the removable back open and you can see the non-removable 2110mAh battery, the microSD card expansion slot and the SIM slot. Some markets come with dual SIM capability, but not the UK. There are few compromises here and even fewer when considering the power available to the ZenFone 5. That Intel Atom chip is a Z2560, which is a dual-core 1.6Ghz unit. It supports Intel's HyperThreading technology that allows the operating system to see each physical core as two processing cores, further improving performance. Multitasking is excellent on the ZenFone 5 as it has a full 2GB of RAM. The 16GB of internal storage is generous for a device at this end of the market and the microSD card expansion means there is plenty of room for all your media. In equalling the screen resolution of the current lower cost Android champion, the Moto G, Asus has made the ZenFone 5 a great device for watching video and playing games. The screen is bright and sharp and nicely responsive. It is even usable outdoors in sunlight and the auto-brightness does a great job too. All told, the ZenFone 5 package is rather excellent. The model I have here only supports 3G network bands but there is another model available for £20 (about US$32, AU$36) more which supports 4G and runs a Qualcomm Snapdragon 400 chip instead of the Intel Atom. At just £179 (around $290, AU$325), this 3G model is excellent value considering what you get. Whichever model you get there is Bluetooth 4.0, solid GPS, and single band Wi-Fi. There is even a compass and a hall sensor, which is used for the optional cover that Asus sells that can switch the screen on and off as it is opened or closed. It has been eight months since the ZenFone 5 was announced. Was it worth the wait? Asus has done a great job with the hardware but what of the software? The ZenFone 5 runs Asus' new Android skin, Zen UI, which I find very pleasant and colourful. It has the modern flat design that is very much in vogue today and is fast to operate. Unfortunately it only runs on Android 4.3, which is a real pity. Part of the reason for the lower Android version is that Intel has been a bit slow in providing its update that supports Android 4.4 Kitkat and Asus is not known for rapid software updates. 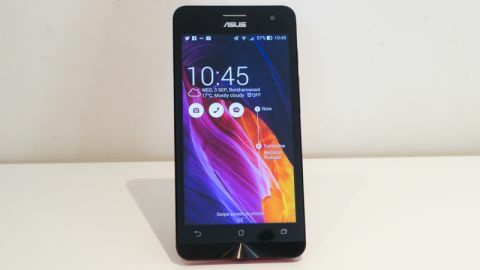 The 4G model does run Kitkat though and hopefully Asus will get all ZenFone 5's up to date very soon.